The room looks beautiful and had everything I needed for a 4-night stay - a little kitchenette, coffee machine, washing machine, etc. The location is very nice especially to explore the East side of London. It is a very short bus ride from Shoreditch High Street. The Garden Room which opens for brunch is exceptionally stunning. Very helpful staff! Breakfast was great and property was well designed and decorated. Within walking distance to underground transportation made navigation around London much easier. I had a terrible brunch with too friends. We actually left and went across the street to eat. It's the second time that I choose to live in the hotel, very large accommodation with very modern facilities, the room service is excellent and the room is very clean, the staff will try to meet all your needs with very efficient and in a good manner. The hotel is 5 minutes walk to the subway(Central Line) which is also convenient. All is with the amazing experience, highly recommend the luxury room which contains four people that four friends and stay together enjoy the time. Staff were very nice Decor was lovely , very clean room. The size and design of the room were great! We also liked the pool. Another wonderful Stay at the Town Hall. Silent top floor room, great food and wonderful Staff. Love the interior and history of this place, the staff is very friendly and helpful. Good breakfast served in the Corner Room upstairs (love the decor, again). Room was clean and bright. Lock in a great price for Town Hall Hotel & Apartments – rated 8.8 by recent guests! Town Hall Hotel & Apartments This rating is a reflection of how the property compares to the industry standard when it comes to price, facilities and services available. It's based on a self-evaluation by the property. Use this rating to help choose your stay! In London’s vibrant East End, 5-star Town Hall Hotel & Apartments feature a swimming pool, free Wi-Fi and fitness equipment. Bethnal Green Tube Station is just a 5-minute walk away. Town Hall offers a range of spacious serviced apartments, stylish hotel bedrooms and spectacular suites. Apartment features include modern lounge areas, DVD players and satellite TV. Located on the first floor of the Town Hall Hotel, the Corner Room Restaurant offers guests a dining experience at a reasonable cost. The Chef looks to showcase big flavors with his daily menus of seasonal dishes drawing inspiration from his love of French cooking. City airport can be reached in 20 minutes by car, and the famous attractions surrounding Westminster are just a 20-minute Tube journey away. When would you like to stay at Town Hall Hotel & Apartments? This luxurious Double Room has a Musetti coffee maker, free Wi-Fi, an iPod dock, a flat-screen TV/DVD player, luxury toiletries, complementary mineral water and milk. This room cannot accommodate an extra bed. 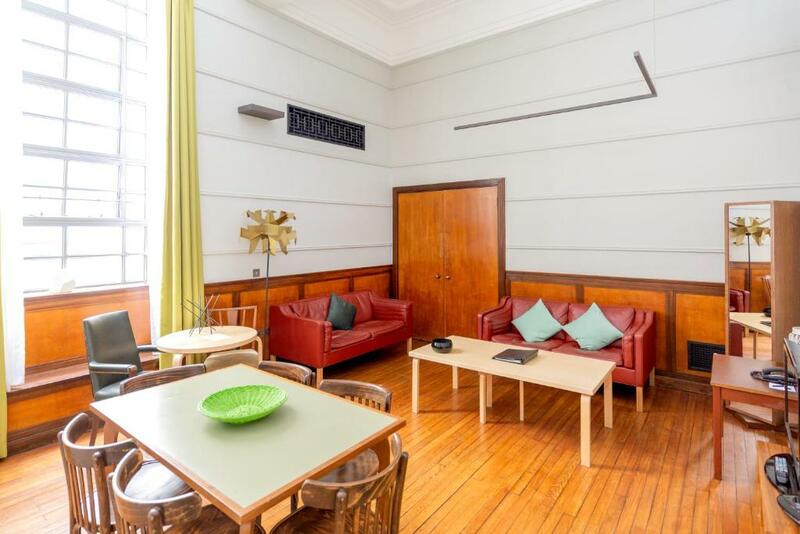 This spacious open-plan studio apartment has a separate living area and full kitchen. Some apartments have period and architectural features. Some include a mix of custom and vintage retro furniture, and a Musetti coffee maker. The apartment includes free Wi-Fi, an iPod dock, a flat-screen TV/DVD player, luxury toiletries, complementary mineral water and milk. This 1-bedroom apartment has a separate living area and bedroom, as well as a full kitchen. It has a mix of custom and vintage retro furniture and a Musetti coffee maker. It also includes free Wi-Fi, an iPod dock, a flat-screen TV/DVD player, luxury toiletries, complementary mineral water and milk. This spacious executive 1-bedroom apartment has a separate living area and a bedroom, as well as a full kitchen. A Musetti coffee maker, free Wi-Fi, an iPod dock, a flat-screen TV/DVD player, luxury toiletries, complementary mineral water and milk are also provided. Most executive 1-bedroom apartments have period or architectural features and all have a mix of custom and vintage retro furniture. This 2-bedroom apartment has a separate living room, 2 double bedrooms, 2 bathrooms, and a full kitchen. It has a mix of custom and vintage retro furniture and a Musetti coffee maker. It also includes free Wi-Fi, an iPod dock, a flat-screen TV/DVD player, luxury toiletries, complementary mineral water and milk. From the moment you catch sight of the Town Hall Hotel and walk into the marble entranceway with its sweeping staircase and art-deco interior, you know your stay will be memorable. Town Hall Hotel is your dream pied-a-terre in the heart of London’s vibrant East End, where five star amenities are combined with the space, convenience and comfort of a designer apartment. Work out in the poolside gym; cook your favourite dinner in your superbly appointed kitchen or treat yourself to an evening at Typing Room or Corner Room restaurant; enjoy the newly commissioned art on display by London’s most exciting young artists; choose a decadent cocktail or simply relax in your room, furnished with the most luxuriously comfortable furniture and some unique vintage collectibles… No one who’s tried Town Hall Hotel living will ever return to a standard hotel again. House Rules Town Hall Hotel & Apartments takes special requests – add in the next step! One older child or adult is charged GBP 75 per person per night in an extra bed. Town Hall Hotel &amp; Apartments accepts these cards and reserves the right to temporarily hold an amount prior to arrival. Town Hall Hotel & Apartments accepts these cards and reserves the right to temporarily hold an amount prior to arrival. Please note that the Typing Room restaurant will be closed from 01 July 2018. Staff could not have been more helpful. Fire alarm went on a few times during the night for no reason. There was a cold breeze coming from the windows, even though they were closed. Multiple notes about paying for extras, at some stage you wonder if you can use toilet paper or you have to pay for it. Great Hotel in a fantastic building. It was £350 for 1 night which didn’t include breakfast, the pictures of the rooms on the internet looked vibrant and modern while in reality it was dark dingy with no basic extraction fan in the bathroom. There was also a very loud wedding going on till late which we were not forewarned about. The bed was very comfortable and the staff were consistently professional/friendly and helpful. Impressive exterior. Great place to stay (perso or pro trip). Don’t Forget a swimsuit ;-). And Good shoes to walk to Victoria park. Very spacious and comfortable room, well equipped. Very nice décor throughout the hotel.